Make new memories in the middle of the California desert. 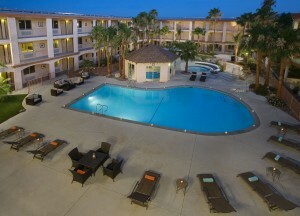 Located in Desert Hot Springs, California one will find a small oasis at Aqua Soleil. Indulge in rich hot mineral pools and spas, delicious breakfasts and numerous spa treatments. There truly is a relaxing moment for all. Natural mineral hot springs feed the outdoor swimming pool, along with the both jetted pools. Take in a weekend movie, poolside, while soaking away life’s troubles. Aqua Soleil offers a full spectrum of spa treatments from deep tissue massage to custom ant-aging wraps. They utilize organic, natural and pure products for all of their spa treatments, enhancing your experience even deeper. When not taking a dip or treating yourself with a massage, take in the tropical courtyard setting and complimentary wi-fi. Feel confident that your stay will be comfortable, relaxing and well taken care of by friendly faces. Choose from a variety of suites or tastefully decorated standard rooms. Filled with amenities like flat screen TVs, robes and slippers in the Soleil Suites, mini-fridges, complimentary wi-fi and parking. Aqua Soleil is also pet-friendly for those traveling with their four-legged friends. From Palm Springs, head West on E. Alejo Road. Turn Right onto N. Indian Canyon Drive. In approximately 6.5 miles, turn Right onto Dillon Road. After another 2.5 miles, turn Left onto Palm Drive. Aqua Soleil is just under 1.5 miles down the road!